Explain how the advance and retreat of glaciers affect rates of deposition and other Earth processes. 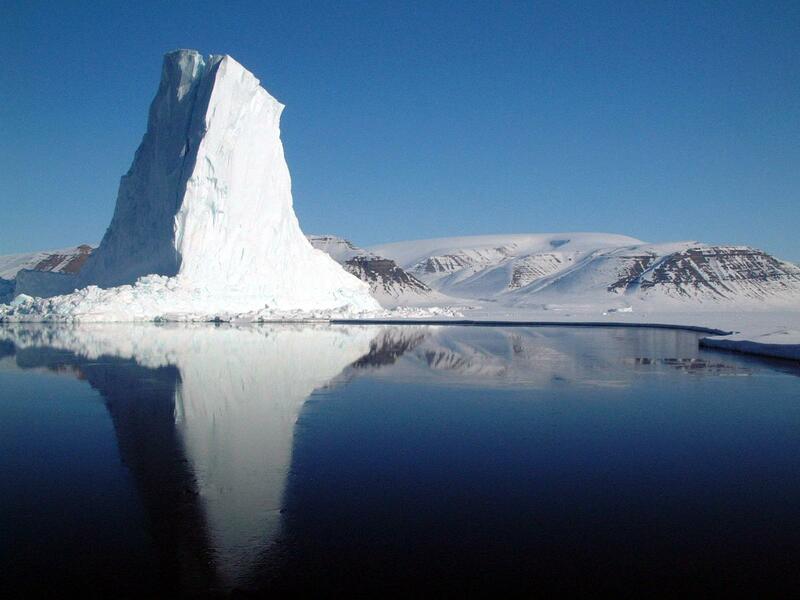 Describe the processes that enable glaciers and ice sheets to increase the rate of sedimentation at ocean margins. 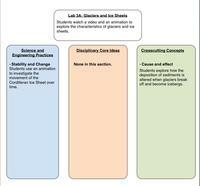 Identify the climate cycles and explain what causes them. In Part A, students explore the nature of glaciers and ice sheets. They watch a video (Time-Lapse Video: Retreating Glacier) that shows them how glaciers retreat and how calving takes place. Then they view an animation that shows the retreat of the Laurentide Ice Sheet over the past 20,000 years. Students watch a video presented by Richard Alley that describes the Milankovic cycles, variations in the orbital characteristics of Earth that lead to changes in climate. Students fill out a table summarizing the nature and period of each cycle. Then students interpret two graphs that show changes in climate over the past 5.5 million years that were caused by the Milankovic cycles. 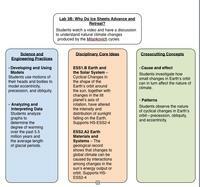 Read through the lab and teacher resources BEFORE introducing it to your students. In Part A: Students watch two videos and an animation to learn about how glaciers and ice sheets erode the land then deposit sediments in the ocean as icebergs break off the edge of the ice sheet. At the end of the Retreating Glacier video, point out the sediment that is visible in the glacier (lateral moraines). Note that the calving process occurs any time an ice shelf projects over an ocean margin. This is an important point since an increase in sedimentation in an ocean basin is indicative of a cold climate, and an advancing ice sheet, not a melting, receding glacier as shown in the first two videos. Wrap Up: Go over the Stop and Think questions with students to make sure they realize that finding dropstones indicates a colder climate. If uniform layers of mud and fine sand are present in a core, this indicates warmer temperatures. In Part B: Students learn about the 3 Milankovic cycles by watching a video and filling out a table. If you show the Milankovic Cycle video on your computer, pause after each cycle description and field any student questions. Point out to students that the diagrams used in the video are not to scale, in fact, not even close. Explain that the eccentricity of Earth's orbit is so small that the orbit would look like a perfect circle if seen from above the plane of the solar system. Wrap Up: Discuss with students whether or not the Milankovic Cycles might explain current global climate change. After students voice their views on the subject, display the Climate Change: How Do We Know graphic. Point out just how steeply the carbon dioxide levels, and subsequent temperature increases, is compared to natural cycles. It might be fun for students to demonstrate these three motions using their heads and bodies. Have them pair up and run through the cycles together. Optional: Use a hula hoop, as Richard Alley did in the video, to demonstrate how the eccentricity of Earth's orbit changes. Teachers may decide to collect and grade Table B.
Vostok Core and Milankovic Cycles Climate Applet: Interactive applet with animation and graphs designed to help students visualize the Milankovitch Cycles.